Alabama Rot in dogs is a devastating disease and is fatal in 90% of UK cases. Regrettably, there are few ‘experts’ in Alabama Rot treatment. Since there have only been 76 reported (confirmed or unconfirmed) cases (at 22/2/15), the vast majority of the 18,000 practising vets in the UK have never treated a dog for Alabama Rot. By December 2014 AMVS had successfully treated seven dogs with Alabama Rot – out of nineteen dogs seen. This 37% success rate is overwhelmingly superior to all other UK vets (personal communication). An 8th dog successfully ‘Treated at Anderson Moores’ (blue circle – see below) was announced 29th January 2015. Regrettably, AMVS have only seen a quarter of the seventy six reported UK cases. David Walker blogs news about Alabama Rot and a fact sheet for owners and vets. David has written articles about Alabama Rot in The Veterinary Expert and the British Small Animal Veterinary Association (BSAVA). He and others published (March 2015) a paper reviewing 30 cases of Alabama Rot, in the Veterinary Record. For a second opinion I’d see Rosanne Jepson of the Royal Veterinary College (RVC) in London. Rosanne and Shailen Jasani hosted a podcast about Alabama Rot in April 2014 (with Facebook comments). RVC has treated at least 3 dogs for Alabama Rot. 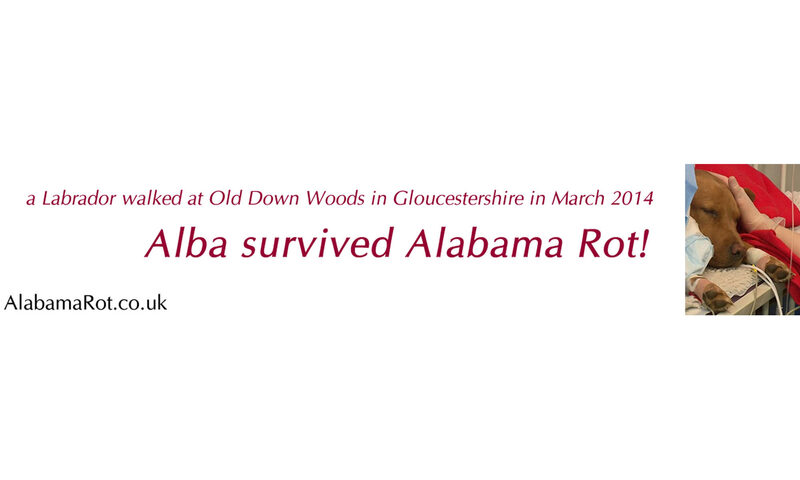 RVC successfully treated a labrador called Alba walked at Old down Woods in South Gloucestershire (see Unconfirmed Cases – Survived and below). She was treated successfully by RVC with plasmapheresis (listen to the podcast from 25 minutes). 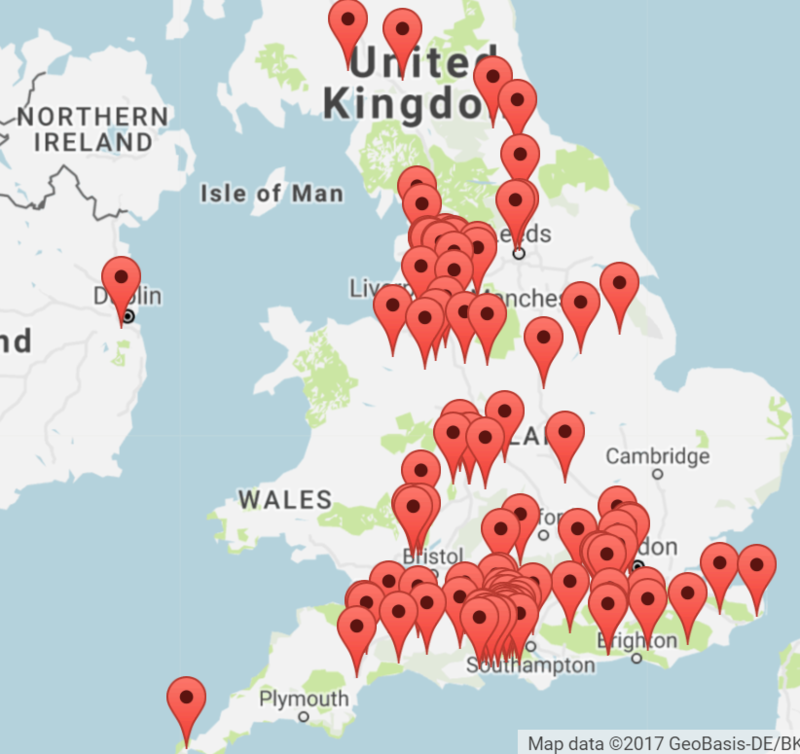 There have been 55 cases of confirmed Alabama Rot in which the dog has died (and had a post mortem); a further 13 cases where Alabama Rot was unconfirmed (without a post mortem) and the dogs died – a total of 68 cases (see my Alabama Rot UK map). Out of 76 recorded cases only 8 dogs have survived Alabama Rot. 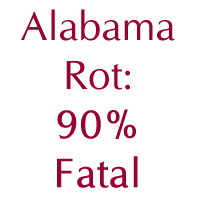 That’s a 90%* fatality rate. This rate could be even greater than this because AMVS stopped publishing some unconfirmed cases of dogs that died of Alabama Rot around March 2014 (personal communication). At May 2015, all of the Alabama Rot survivors that I know about, either had been referred to Anderson Moores (7 dogs), or to the Royal Veterinary College (1 dog). WHY have the unconfirmed / suspected cases been erased from the site? That’s very misleading in numbers, so all of your calculations actually mean nothing and are NOT TRUE!! Would like to know exact locations of Alabama rot cases both confirmed and suspected as I visit the hants/Dorset area frequently – at least once a month. I have notice that this is only found in soil in forest never on the coastal area. Yes it seems to be the case that dogs walked by the beach don’t get Alabama Rot. This seems a retrograde step to me. 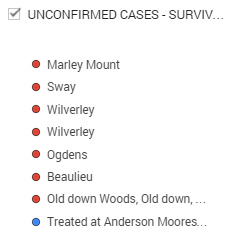 I’d rather know ALL the locations that dogs were walked up to one month before Alabama Rot symptoms – as Anderson Moores says, we don’t know how long the trigger (if one exists) takes to become visible as skin lesions / Acute Kidney Injury.